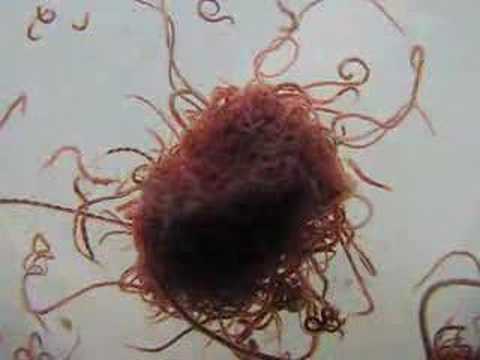 WHAT ABOUT PARASITES AND PATHOGENS IN RAW DIET? What about pathogens and parasites? I get a chuckle out of my allopathic vet. He doesn’t agree with my raw feeding but says I have the healthiest dogs in his practice. He eats his steaks well done and asks me “didn’t you take parasitology in college?” “Yes, I did. But I don’t eat raw meat. My dogs do, and they’re designed for it”. I freeze meat for two weeks to kill any parasites, and I do clean up my prep area with natural cleansers like Thieves Household Cleaner. That’s to protect the humans in my house, not for the dogs. They can eat rotting meat (not that I would feed it), but here’s why. 1.A carnivore's stomach secretes powerful digestive enzymes with about 10 times the amount of hydrochloric acid than a human or herbivore. The pH is less than or equal to "1" with food in the stomach, for a carnivore or omnivore. For humans or other herbivores, the pH ranges from 4 to 5 with food in the stomach. Hence, man must prepare his meats with laborious cooking or frying methods. E. Coli bacteria, salmonella, campylobacter, trichina worms [parasites] or other pathogens would not survive in the stomach of a lion. 2.A carnivore's or omnivore's small intestine is three to six times the length of its trunk. This is a tool designed for rapid elimination of food that rots quickly. Man's, as well as other herbivore's small intestines are 10 to 12 times the length of their body, and winds itself back and forth in random directions. This is a tool designed for keeping food in it for long enough periods of time so that all the valuable nutrients and minerals can be extracted from it before it enters the large intestine. 3.A carnivore's or omnivore's large intestine is relatively short and simple, like a pipe. This passage is also relatively smooth and runs fairly straight so that fatty wastes high in cholesterol can easily slide out before they start to putrefy. Man's, as well as other herbivore's large intestines, or colons, are puckered and pouched, an apparatus that runs in three directions (ascending, traversing and descending), designed to hold wastes that originally were foods high in water content. This is so that the fluids can be extracted from these wastes, now that all the useful nutrients and minerals have been extracted and the long journey through the small intestine is over. Substances high in fat and cholesterol that have been putrefying for hours during their long stay in the small intestine tend to get stuck in the pockets that line the large intestine.